Time flies and November is already upon us. We are busily gearing up for the IRF International Road Congress ‘Innovation in Road Infrastructure’, which will take place in three weeks from now in Moscow. During this landmark event, the IRF Board of Directors will also meet to finalise the programme and budgets for 2012. Already, we can tell you that 2012 will be an exciting and enriching year for IRF members. A number of political issues are currently in the air which could have a bearing on your business. We will work diligently to represent the road infrastructure industry efficiently and make sure that your voice is heard. In the meantime, we are pleased to advise you that the IRF 2011 World Road Statistics have just been published, and that IRF members will be receiving their copies shortly. The World Road Statistics can also be ordered through our office and the relevant order form can be accessed here. 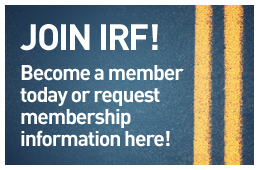 Alternatively, simply send a message to stats@irfnet.org. We hope to see as many as possible of you in Moscow. Please register promptly while there is still just enough time to obtain a visa for Russia. If you have any questions regarding the Conference, feel free to contact Caroline Visser at cvisser@irfnet.org. Enjoy reading our Newsletter, and thank you for your continued support. Cavtat was the beautiful setting for the 5th Croatian Road Congress, to which the chairman of the organising committee, Mr. Zeljko Vivoda of Via Vita, the Croatian Road Society, invited IRF as guest of honour. The IRF Policy Committee on ITS took the opportunity of the annual ITS World Congress, this year held on 16-21 October in Orlando, Florida, to convene an information meeting on Sunday 16 October and bring together representatives of the IRF membership, national ITS associations and others. Some 450 delegates gathered in the German capital Berlin for the IBTTA 79th Annual Meeting & Exhibition. Themed ‘Making the Difference' and hosted by Toll Collect, the event included some impressive main sessions and panel discussions as well as a series of interesting break out sessions. The recent organisation of the 6th IRF Regional Conference: Road Safety Strategy in India – Action Plan, in parallel with the first Intertraffic® India Exhibition and Trade Show highlighted the complementarities and immense potential of a business-like approach to Road Safety and related global causes. On Tuesday 27 September 2011, the IRF Policy Committee on ITS, together with IRF member Tecnosistemas y Peaje SA de CV, convened a conference on ‘Transport and Mobility – A Smart Investment', in Mexico City, in conjunction with the PIARC World Congress. During its Annual General Meeting held on Wednesday 19 October in Orlando, United States, the International Benefits Evaluation and Costs (IBEC) working group elected Mrs. Caroline Visser, Road Finance & ITS Programme Manager at IRF Geneva, as Junior Vice Chair for 2012. More than one hundred representatives of over 50 design and engineering firms from Israel are participating in a "networking" marathon with dozens of engineering firms from overseas. The one-on-one business meeting event is an initiative of the Israel National Roads Company aimed at encouraging partnerships with foreign designers in transportation infrastructure projects in Israel.